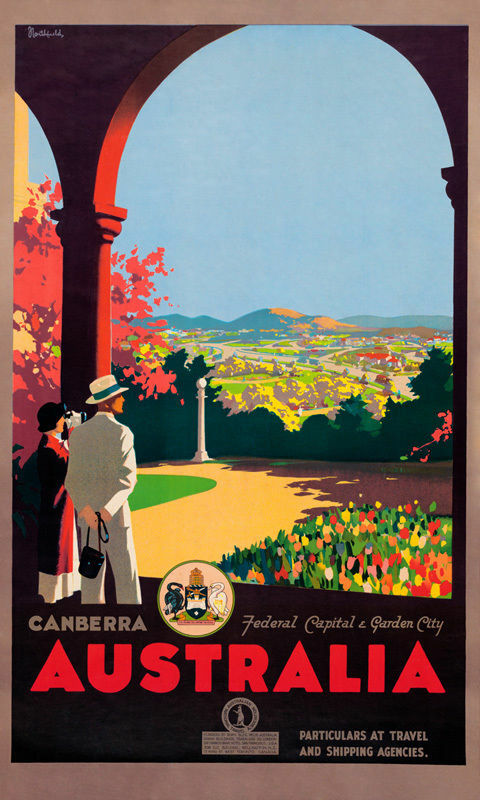 Just came across this amazing tourism poster for Canberra, printed in about 1930. Everything I know about this image comes from page 44 of James Northfield and the art of selling Australia (2006) where the image is reproduced with the following caption: “On 31 August 1933 Charles Holmes, Director of the Australian National Travel Association, wrote to C.S. Daley who was then Civic Representative of the Department of the Interior, Canberra. Holmes was replying to Daley’s request for ways of popularising Canberra as a tourist resort amongst Australians. Holmes […] mentioned that he had arranged for James Northfield, whom he considered ‘one of the leading commercial artists in Australia’, to pay a visit to Canberra with a veiw to producing a poster which would be circulated ‘throughout the English speaking world'”. What fascinates me is the way it captures the early utopian vision for Canberra a style that is more directly associated with European pre-war art and propaganda. There are traces here of Metropolis, German Expressionism and Italian Futurism except the vision that is being sold is of a civilised pastoral metropolis, as opposed to a dynamic techno-utopia. And interestingly this is still how Canberra is represented today: a ‘bush capital’ marked out by imposing civil institutions.